*Travel Blitz will be a new series of posts on Motormouth From Ipoh; highlighting interesting food and travel bits from all over Malaysia. This coincides with the surge of travelling lately, and serves as a platform to channel Motormouth’s scattered thoughts and ramblings. #1 – This shot was taken from the Signal Hill Observatory Tower in the centre of Kota Kinabalu; on Jalan Bukit Bendera. 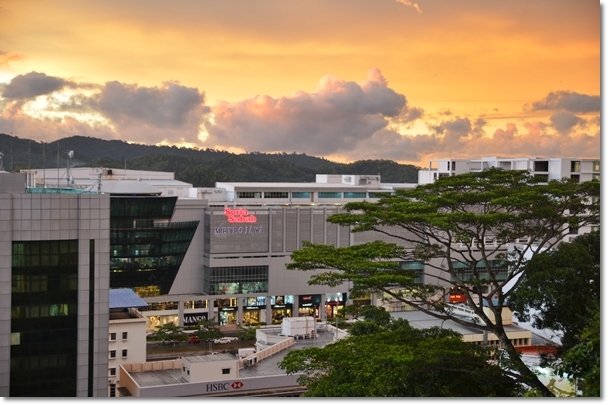 Nearby landmarks include Suria Sabah and Gaya Street. When it’s time to purge the blues away, best way is to dig deep into the archives and scour for one travel post to return one reassuring smile over this jaded face. Although this time around I don’t have to, with backlogs piling up all over the place. 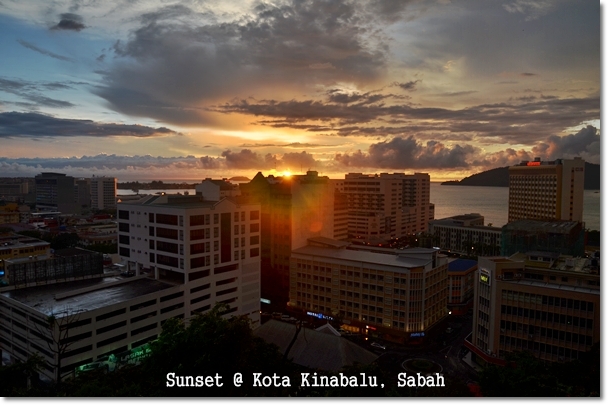 Kota Kinabalu; the capital of Sabah has never failed to fascinate me. This being my third visit to the town, and yet I’m still discovering something share-worthy every time. 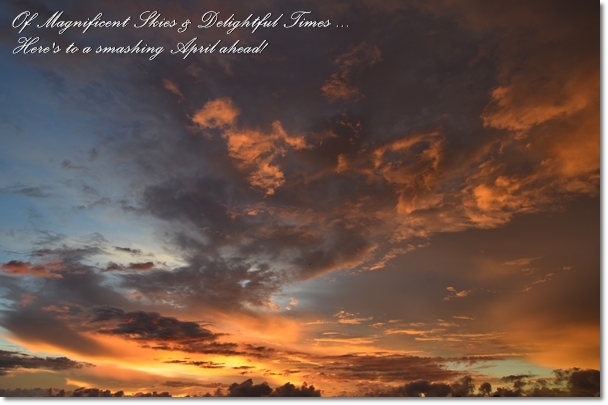 My last visit to KK was around June last year, and this time around I was introduced to one very famous Italian restaurant in town, a Chinese curry laksa on Jalan Gaya that’s crowded during breakfast hours, and the magnificent sunset painting the skies with a brilliant hue of gold ….. This time around, I spent a rather short two days, one night in town. 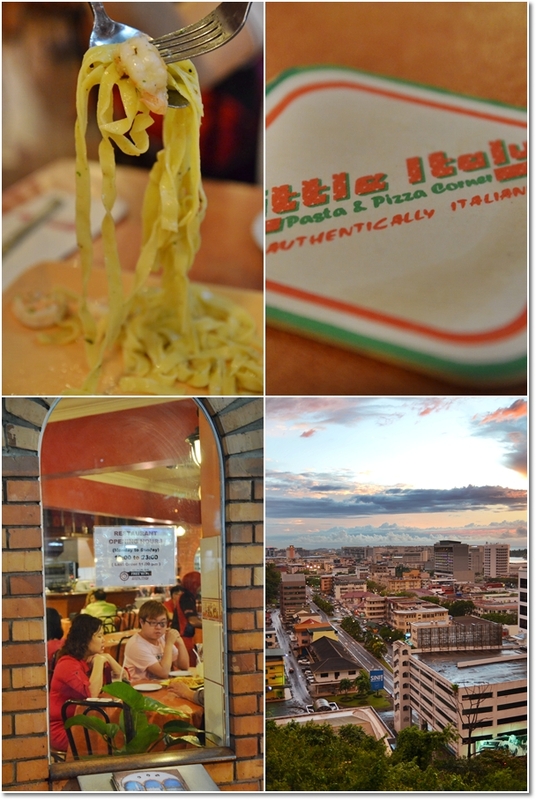 And without much time for sightseeing/jaywalking/ruckus-causing activities, I was brought to Little Italy for a relatively rushed dinner, then breakfast the very next day at Yee Fung on Gaya street for their famous laksa and other noodles. Little Italy bakes some pretty mean pizzas; with authenticity retained and of high quality. 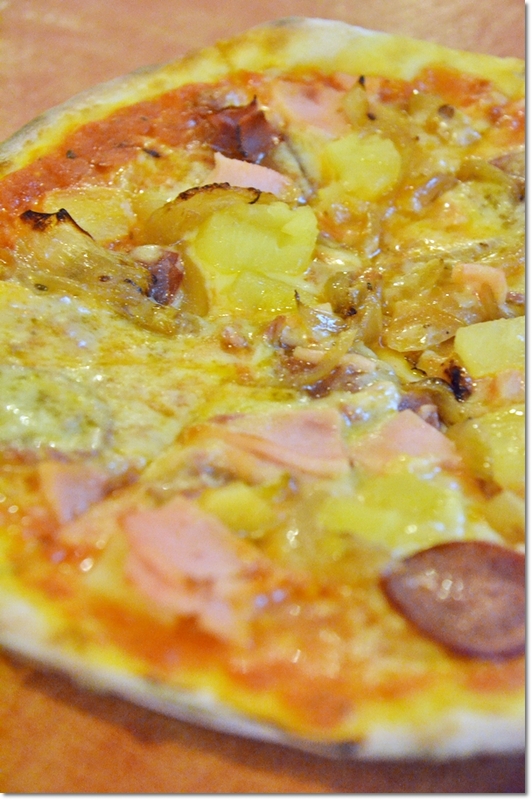 This was one with salami, pineapple, ham and caramelized onions, I believe. Sorry, lost the receipt and this was more than a month ago. Anyway, the pizza was good. Light, without being weighed down by excessive dough and adjusted tangy/tartness of the tomato puree. And fresh, homemade pastas cooked to a beautiful al dente texture; hereby lightly tossed in olive oil (notice the small container behind?) and served with plump, succulent prawns. This was an Aglio-Olio rendition with added zing from the fresh crustaceans. Good latte and ice-blended coffee to down the pizzas with … since Little Italy caters to all races, the food here is pork-free and I don’t remember alcohol being served. But I could be wrong, as we merely breezed through the menu to tally with the one hour of allocated meal time. 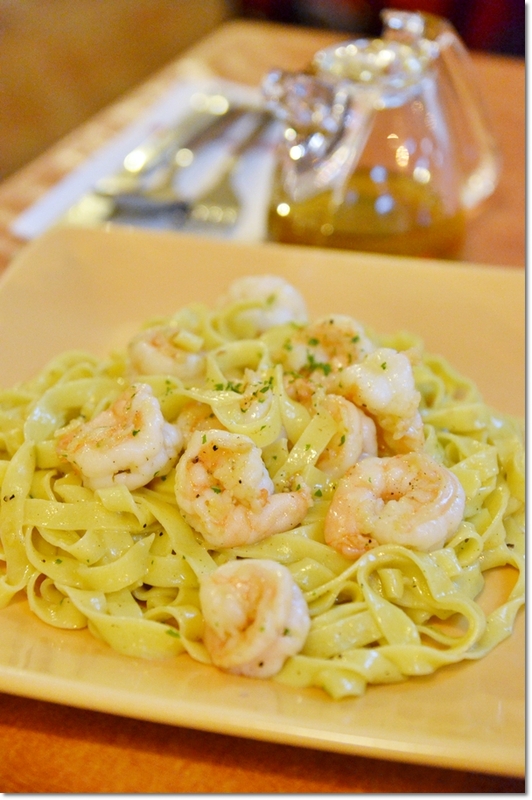 For a taste of good old Italian food, Little Italy actually surpasses expectations and hype. In case you’re weary of the same old seafood (but why should you?!) and street fares, why not go Italian? Aside from Little Italy, you can actually walk to many of the highlighted eateries around Gaya street and its vicinity. There are two equally famous bak kut teh restaurants within a street or two apart, one being Yu Kee on Gaya street, and another I have neglected to take down the name. There’s also this Chinese nasi lemak stall along the same street. This post may seem to have short-changed you, I know. I felt the same way too. But then again, this was never meant to be a full-fledged food review anyway. Aiya .. sometimes, allow me some leeway ya? More Travel Blitz in the coming days, before I jump back into the fray and write elaborate reviews once again. Oh, and then there’s the NEW Jusco/AEON at Station 18 that’s drawing me closer for a look this coming weekend. Let’s hope that there’s something worthy to be eaten there. Not in the mall, of course. The surrounding area of Pasir Puteh and Pengkalan …… I remember this pretty good pan mee shop that a few raved about not too long ago. Is it still there? It’s April Fool, but I am not kidding you. I pray that the turbulent times are over, and life can be re-tuned to what it was before this. 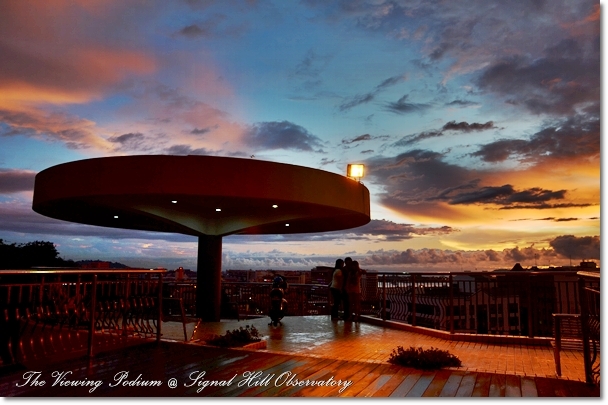 Love Kota Kinabalu especially that sunset view from Signal Observatory Tower! wow the sunset photos are awesome! Have only been once to Sabah but look forward to going back to explore some more. 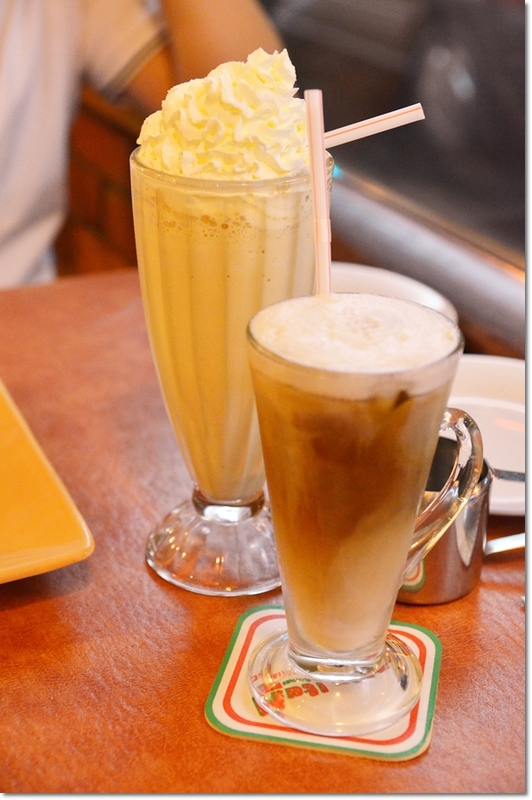 Yeah, I am looking forward to the next visit very soon … maybe Sandakan the next round. Thanks Daniel. I was in KK for a night only. Or two, damn this old man’s memory! Will drop you a mail the next round I am in KK.